weatherproof barrier protecting your patio or vehicle from the elements. This 'material's supplied' expanded polystyrene (EPS) core insulated roof system provides a combination of strength and clean lines that will add value to your home every single time! Your new patio cover can be specifically designed to accommodate ceiling fans and light fixtures, giving your new outdoor space extra amenities. The understructure for the SMP SmartLok insulated roof panels is made from high-quality structural extruded aluminum. Virtually maintenance free, our covers are crafted to never rust, warp, crack, rot or become infested with insects. 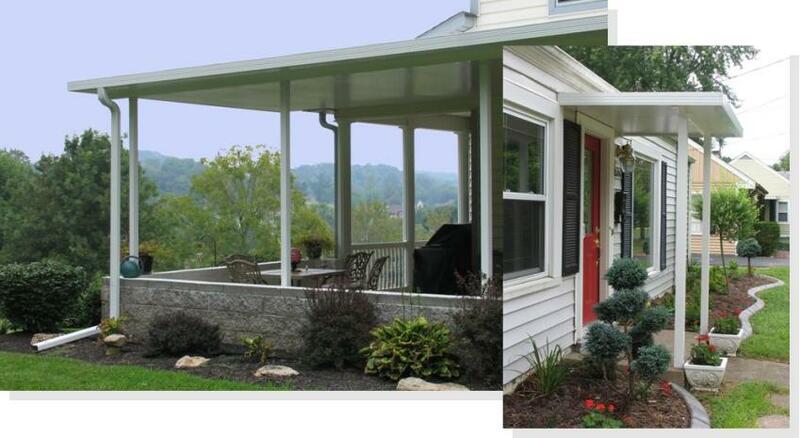 Our factory-finished aluminum components retain the original color, gloss and texture longer and better than patio products made of alternate materials. Plus we stand behind our products with a transferable Lifetime Warranty. Your new insulated patio cover kit will prevent any heat transfer to the underside of the unit and keep your new space 10-15 degrees cooler on those extreme summer days while standing strong against the snow loads in those winter months. Each system is engineered according to your local code requirements and we deliver throughout the contiguous USA! Stucco embossed finish - .024" laminated aluminum skin applied to top and bottom creates a durable dual layer system which resists scratches, corrosion and fading. Optional .032" skin available for added strength & durability. Panel thickness is usually determined by local load requirements and desired panel span. 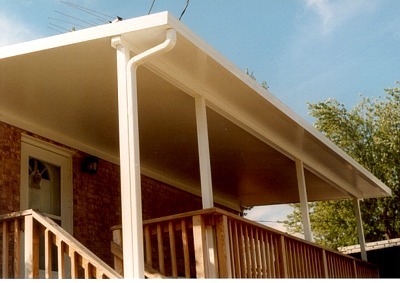 High density 1.5 lb structural expanded polystyrene (EPS) core prevents thermal transfer to the underside of the patio cover and strength to accommodate the snow and wind load requirements for your area. Downspouts are not included but are an option. Don't see your size? No Problem! Your city building department is where building permits are issued from. You may or may not need an actual permit for your installation, and this is left as the sole responsibility of the homeowner. It is our strong recommendation that you acquire your permit prior to purchase. We can help with that! However, panel thickness, beam placements, beam size, distance between posts out front... all are a function of the load (snow & wind) that your cover will be subject to. Even though you may not require a permit, you will still need to contact them to get your local building code requirements so that we can supply you with the 'correct' materials! a set of beam and posts or an existing set of walls. Lag screws for "roof to structure" connection are not included. (1) x 16' | 3" x 3" x .125"
(1) x 20' | 3" x 3" x .078"
(1) x 24' | 3" x 3" x .125"
(1) x 20' | 3" x 3" x .125"
(1) x 24' | 3" x 3" x .078"
(2) x 24' | 3" x 3" x .125"
(1) x 20' C-Beam | 6.75" x 2.75"
(1) x 24' C-Beam | 6.75" x 2.75"
(1) x 30' I-Beam | 5.5" x 7"